Modeling solidification of metal alloys in FLOW-3D CAST involves adding the release of latent heat as well as a special treatment of the flow in the mushy region (the transition phase of solidifying materials). The solidification model can be used when modeling a wide range of casting processes. Modeling the two-phase solid/liquid flow of metal during solidification is approached by dividing the mushy region into three zones. In the early stages of solidification, the forming solid crystals are assumed to be disconnected from each other. Therefore, the solid/liquid mixture moves as one fluid. The effective viscosity of such fluid is higher than that of the pure liquid and is computed as a function of solid fraction. When solid fraction reaches the coherency point, the solidified crystals form a rigid skeleton that is attached to the mold walls and, therefore, does not move. The flow then becomes that of a pure liquid though a porous media and is modeled by applying a D’Arcy-type drag force to the moving fluid. Finally, when the solid fraction exceeds the critical value, the solidified metal forms such a dense structure that liquid metal can no longer flow through it. This is modeled by applying an infinitely large drag force. Even though solidification continues after this, the metal is assumed to be effectively frozen. The binary alloy segregation model predicts macro-segregation patterns that form due to the thermal and solutal buoyancy-driven flows in the solidifying metal. The formation of macro and microporosity due to volume shrinkage during solidification can also be described. Together with the defect tracking and air entrainment models, the porosity model helps to evaluate the quality of the final part. Special criterion functions can be used to predict the variations in primary and secondary dendrite arm spacing. The elastic stress model computes stresses and deformations in a cooling part. 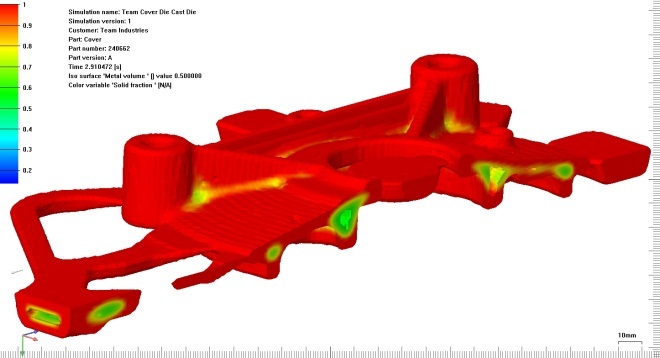 The drift-flux model allows users to describe the separation of liquid and solid phases during the semi-solid metal casting process. Special numerical models are also available for more efficient calculations, such as the implicit heat transfer model and a zero-velocity field model. The latter is useful when the effect of metal flow on solidification dynamics is negligible, which is often the case after the filling is complete.